In addition, just as utility-connected building has become simplified or more modular over the years – a trend often obscured by the many building systems and functions that have been added in this timeframe – more natural or naturally autonomous building promises to follow a similar path of systematization, standardization, and simplification over time as well. This eventual trend may be of only modest comfort if you want to build a more natural or autonomous building now, or in the near term. So, to both explore how autonomous building is likely to become more systematized, modular, or integrated over time, and also to help you plan and create more integrated autonomous buildings today, I’ve developed the attached Modern Natural Building System Overview schematic (click to enlarge) to help you envision and design modern mechanical systems at various levels of building autonomy. As you can see, the schematic summarizes a flexible and fairly comprehensive model of how the various mechanical systems of a fully or partially autonomous building might be envisioned and designed. There are of course many alternatives to this approach, but my hope is that this fairly straightforward model, along with the notes below, will help you to better sense how the fairly complex and often daunting work of modern natural building might be conceived of in a more systematic, integrated, and simplified way. > Orientation & passive solar – we’ll cover the model’s active solar system in a moment, but it’s worth beginning by underscoring that proper siting of any building, for optimal sheltering and passive solar gain and gain avoidance, can greatly reduce power needs and thereby promote building autonomy. Care with building orientation can also increase building aesthetics, better integrate a building with its site, and reduce construction costs. > Insulation & air quality – as with building orientation and passive solar considerations, attention to insulation and air quality is an important aspect of achieving increased building autonomy. In general, there are two basic and somewhat exclusive approaches to insulation and air quality: 1) highly insulated and tightly sealed buildings with air heating and cooling, and highly controlled indoor-outdoor air transfer, 2) high mass building with radiant (rather than air) heating and cooling, and a less tightly sealed building envelope. Both approaches have advantages and disadvantages. As you can see, my model leans more toward the latter approach, in particular since this allows simplified building methods and is more tolerant of indoor-outdoor living – building attributes that I personally value as a designer and building dweller. > Photovoltaic (PV) vs thermal panels – in my natural building model, I exclusively use PV or solar electric panels to heat the building and provide hot water (in addition to powering electrical appliances). Notably, there is no use of thermal, or air or water heating, solar panels. This PV-only approach is still controversial as I write this, but decreasingly so, given steady and ongoing improvements in the cost and efficiency of PV panels and associated electrical equipment (including hybrid water heating – and air cooling – systems, a critical component in my building model). Though thermal panels lend themselves to DIY and self-building, they also add undesirable complexity to building systems, and often require considerable oversight and maintenance. > Hybrid water heaters – at the center of my schematic is a hybrid water heater, powered by the PV panels. This water heater both provides hot water for general use and for winter heating of the radiant floor system. As the name implies, a hybrid system has two modes of functioning. In the summer, it uses an indoor heat pump to (very efficiently) extract heat from the building indoor air and heat water for general use, simultaneously cooling and dehumidifying the building’s interior in the process. In the winter, water is instead (less efficiently) heated by a resistance element. Should the heat pump produce excess hot water, owing to demands for greater summer air conditioning, this extra energy is converted back into electricity via thermoelectric panels in or connected to the hot water tank (separate supplemental air conditioning is of course an alternative). > Summer vs winter modes – as you can see in the water, heating, and cooling sub-systems, my model building has distinct summer and winter modes. In addition to different seasonal approaches to water heating and uses of heated water, the system routes water differently by time of year. In the warmer months, naturally cold inbound water is initially run through the radiant floor system to cool the building. In colder months, inbound water is routed directly to the water heating and cold water systems. > Electricity – in my PV-powered model, electrical power production can occur to different degrees. If the building is not connected to an electrical grid, power production normally would be equal to average power use, with storage and drawing on either batteries or an electrolyzer/fuel cell system (the latter is less common today but may be a superior option in the future). If the building is grid-connected, power generation may be less than average power use, with utility supplementation, and also potentially more than average power use, with excess electricity sold to the grid. > Heating & cooling – as mentioned already, in my model, heating is exclusively provided by a radiant floor heating system powered by the hybrid water heater, along with passive solar heat gain. 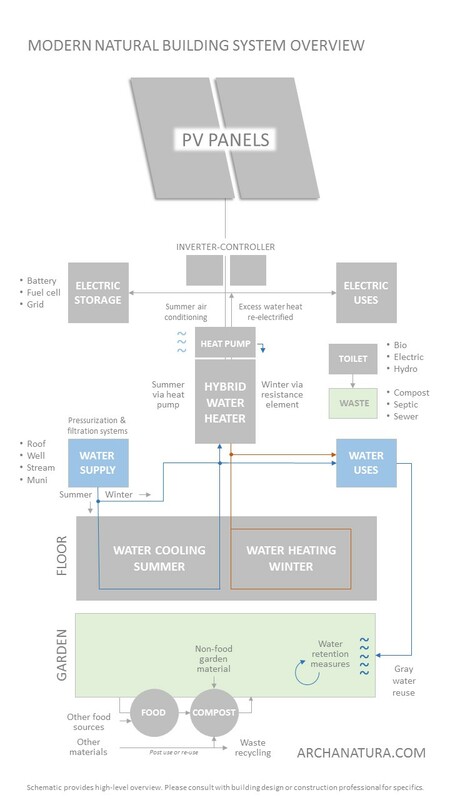 By contrast, cooling is provided in part by the radiant floor system using inbound cold water and in part by the air conditioning effects of the hybrid water heater’s indoor heat pump during warm weather. > Water – as you can see, the model is flexible as respects the building’s primary water source, but the order of the sources listed reflects the relative autonomy and general sustainability of each source. But in all cases, water (except toilet water, if any) is ultimately recycled and used for food production (and material composting) in the building’s garden. And for all water sources, filtering is employed, including removal of chlorine from public water supplies, since water is destined for use or re-use in the building’s garden. > Toilet – as with water, the model is flexible as respects toilet waste, but the listed approaches again reflect each source’s relative tendency to promote autonomy and sustainability in the management of toilet wastes. > Food – the production of food is an integral part of my modern natural building model, promoting autonomy, sustainability, reduced food costs and transportation needs, and superior food quality. The level of food production can vary based on available land, building type, and occupant needs and wishes. In all cases, however, active water retention and groundwater recharging is employed. > Recycling & wastes – in this model, all recyclable materials from building use are recycled, composted in the garden, and/or used to promote food production. The amount of non-recyclable waste will depend on building use, but in principle could approach or reach zero. Naturally autonomous or off-grid modern buildings have great appeal. In addition to providing an advanced state of life for us, they can green and give us greater control of our lives and communities, make modern society more naturally resilient and sustainable, and reduce the cost and environmental impact of traditional utility systems. In time, and as my schematic suggests, highly systematized and integrated approaches to autonomous mechanical systems will become more readily available, making building autonomy increasingly simple, flexible, and inexpensive. In the meantime, my integrated model can help you to understand and plan modern natural buildings at many different levels of autonomy and for many different uses today. Let me know what you think in the comments section below. This entry was posted on June 21, 2016, 12:32 pm and is filed under Buildings, Designs, Ideas, Technology. You can follow any responses to this entry through RSS 2.0. You can leave a response, or trackback from your own site.